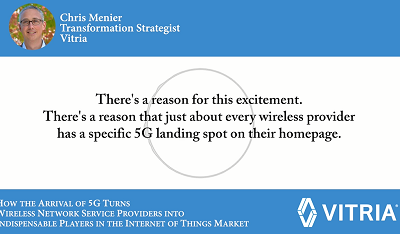 Vitria’s Chris Menier Explores How Arrival of 5G Turns Wireless Network Service Providers into Indispensable Players in the Internet of Things Market. The arrival in 2019 of 5G wireless wide-area networking technology promises to leave an indelible mark on any industry that stands to gain from the rapid evolution of the Internet of Things (IoT), and will place network service providers in an ideal position to serve this market, says Chris Menier, Vice President and Transformation Strategist at Vitria, in an audio interview for journalist. To listen to the full podcast interview with Chris Menier, please fill out the form.